Briefing reporters Oct. 10, the archbishop also used the phrase “deep and profound change,” but he expressed his belief that the synod Oct. 3-28 would give the Catholic Church a good start at responding to those changes. “We are an institution which has the strength to get up, to put the questions on the table and to think and to pray and to discern, not with opinions clashing, but with a great listening ability in order to see and feel what God wants us to do,” Archbishop Hollerich said. Cardinal Carlos Aguiar Retes of Mexico City, who joined the archbishop at the briefing, told reporters that synod members are committed to changing the church’s “modus operandi” when it comes to helping young people grow in faith and responsibility. The presence at the synod of 36 observers who are under the age of 30 also “helps us open our eyes more,” the cardinal said. 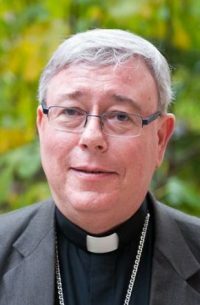 While the synod has not been focusing on politics, the archbishop said emphasizing church teaching on care for the weakest and poorest members of society “is the best answer against populism,” because the political movement relies on a certain level of selfishness. “Now, if we in the church focus on the weakest, on the poorest, on the marginalized, then we are doing prevention against populism,” the archbishop said. — How does the church retell in the words of today the story of the rich young man who asks Jesus what he must do to gain eternal life? For many today, the question would be, “Master, how can I live my life to the fullest?” but young people today often ask the wrong person and receive answers that really aren’t good for them. The right question is how can they empty their hearts and create space for something much greater: self-giving. NEXT: Who are the Chinese bishops received back into ecclesial communion?